A florist in an artist village at Baguio City sold assorted bouquets made from play money and vegetables as unconventional gifts for Valentine’s Day. The bouquets were sold by Paulite Anthoniuz in the Ili-likha Artist Village located near Session Road, one of the popular tourist destinations in the Summer Capital of the Philippines. A bouquet of play money costs P800 in real money. Filipinos admired the colorful bouquets and tagged their respective friends and significant others on social media. One Facebook user commented that she would like to receive such an arrangement as a Valentine’s Day gift. 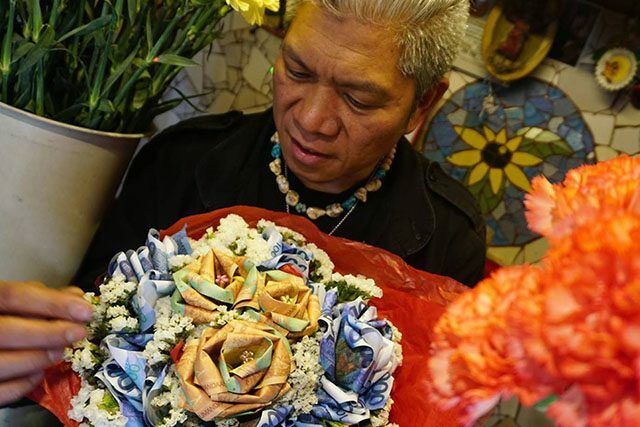 “Mas gusto ko ‘to kesa sa flowers… so creative niyo naman po,” Assiralc O. Ateloz wrote. The Ili-likha Artist Village was conceptualized by film director and writer Eric de Guia in 2014. It exhibits the various artistic works of locals and advocates environmental sustainability. Sample works that can be found in the area are a rainbow staircase made with mosaic tiles, wooden sculptures and paintings of the Cordillera people and other pieces made from recyclable materials. The village also promotes healthy eating where food vendors sell affordable meals without preservatives.